When disaster strikes and leaves a large quantity of people in desperate need for the basics of survival – housing included – it’s important to have solutions at the ready. This simple DIY pallet house is a perfect example of where ingenuity meets philanthropy. Take a minute to read the article below, and then watch the video to learn more and see the construction in action. Architecture and construction have a huge impact on the environment and society; and the recent disasters in China, Myanmar, Iraq, Darfur, Afghanistan, and New Orleans continuously remind us of the symbolic, cultural and physical power of buildings. But there is another more pressing architectural crisis that affects all nations: the question of housing the 1 billion people who live in substandard housing around the world. Pallet House provides a viable and adaptable solution to the housing crisis while simultaneously empowering individuals with simple materials and tools to rebuild their lives and communities. Therein lies architecture’s greatest contribution to humanity…. The inspiration for the Pallet House Project came from the fact that 84% of the world’s refugees could be housed with a year’s supply of recycled American pallets. With one and a half year of pallet production in the US alone, 33 million refugees can live in a Pallet House. Nearly 21 million pallets end in landfills each year which can house over 40,000 refugees. Pallets are specifically designed for transport and delivery – so cost is negligible when carrying shipments of food, medicine and other types of aid to refugees. 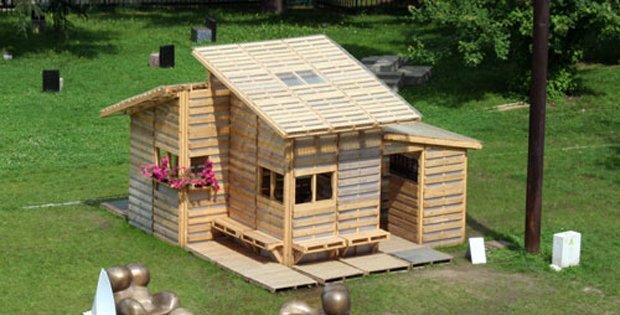 A 250 square foot ‘Pallet House’ requires 100 recycled pallets nailed and lifted into place by 4-5 people using hand tools in under a week. [VIDEO] Been Dreaming of Building Your Very Own Cozy Tiny Home?